How is an open house by appointment only different versus a normal open house? What will happen if I just stop by without scheduling an appointment in advance? An open house by appointment only is a block of time a listing agent has set aside for private showings for a property he or she has for sale. An open house by appointment only is different from a general open house in that walk-in’s are not permitted. Buyers and brokers will need to email in advance to confirm a specific showing time. If no appointments are made, then a listing agent won’t need to show up at all during the listed open house time. 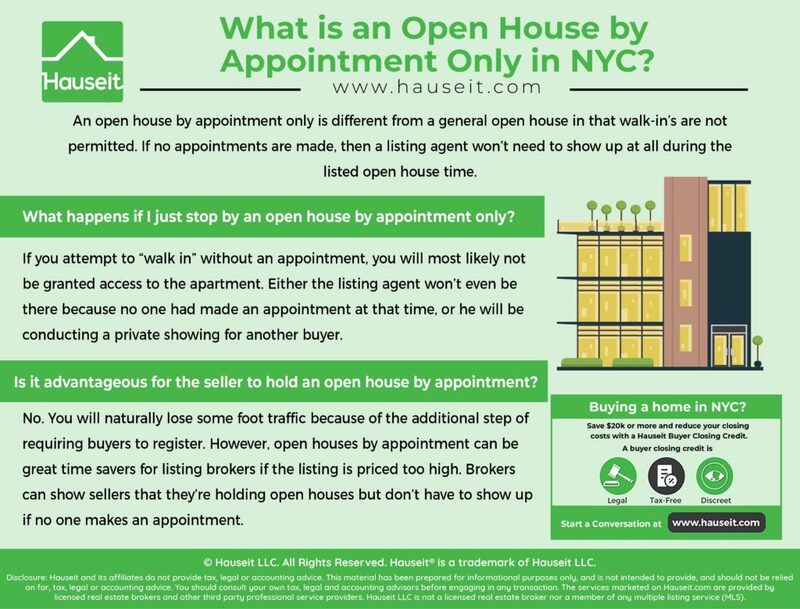 Open houses by appointment only are common in larger buildings in NYC with many apartments. While it is more common to see restrictions on open houses per the House Rules of co-op apartments, condo boards also have the ability to impose restrictions. In larger buildings such as the Corinthian in Murray Hill where there are hundreds of apartments and often dozens of units listed for sale concurrently, the building cannot allow general open houses for good reason. If there are dozens of units listed for sale and all of them tend to have open houses at the same time to catch cross-over traffic, you might see hundreds or even thousands of visitors at the same time. This obviously will not be pleasant for the buildings’ residents and will be extremely annoying to any residents who aren’t selling their homes. Furthermore, large numbers of walk-in open house visitors can be serious security risk for the building. It’s not uncommon for visitors to start exploring the rest of the building after attending an open house. Since there is no vetting at all for walk-in visitors to a general open house, this can be hazardous for the building. There have been stories published from time to time about robberies and thefts taking place at higher end, luxury listings’ open houses. 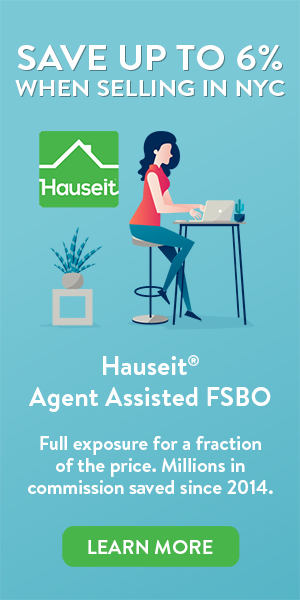 There have also been well known articles published about actual combat taking place between brokers and the FSBO sellers they solicited at a FSBO open house. Clearly, it is not in the best interests of the majority of the residents of a building for this behavior to be taking place consistently year round in their home building. What happens if I just stop by an open house by appointment only? If you attempt to “walk in” without an appointment, you will most likely not be granted access to the apartment. Either the listing agent won’t even be there because no one had made an appointment at that time, or he will be conducting a private showing for another buyer. If you happen to catch the listing agent in person as he’s finishing another appointment, he or she may let you come see the apartment impromptu. This is a dangerous strategy however as some buildings have specific rules on only having one or a certain limited number of groups viewing an apartment at the same time. So even if the listing agent did happen to be in the apartment showing another set of buyers, you may not be allowed to go up. Is it advantageous for the seller to hold an open house by appointment? No. You will naturally lose some foot traffic because of the additional step of requiring buyers to register. Moreover, buyers have busy schedules during Sunday with many showings and open houses in the afternoon. Buyers will invariably run late, which is why having a general open house will offer much more flexibility for a buyer’s schedule. However, open houses by appointment are highly advantageous for listing brokers if the listing is priced too high. In this case, brokers can show to the sellers that they are holding open houses but do not actually have to show up if no one makes an appointment. This is in contrast to an overpriced listing with general open houses where a broker may waste a couple hours at a time sitting by him or herself at an open house. If a listing is under priced or priced right, then a listing broker will much prefer a normal open house in order to maximize foot traffic and the opportunity to meet as many buyers as possible. What is a FSBO Commission Agreement?